Ford is extending their well-liked vinyl graphics program to the 2012 Focus. On a side note, did you know that shows 40% of Millennials (those born between 1980 and 1995) posses a tattoo. Produced from 3M Scotchprint film, the graphics will be available in 200 designs, starting from $120, rising to $470. While that sounds expensive, Ford dealerships will be fitting them and will include a three-year/36,000 mile restricted warranty. The Focus brand executive, KC Dallia said "Millennials have a very personalized, artistic side to their lifestyle, and their vehicle is a very important part of that. With its striking front end, sleek profile, dramatic rising beltline and athletic stance, the Focus provides the perfect canvas for customization." DEARBORN, Mich., Dec. 23, 2010 - The popularity of tattoos has turned body art into a fashion statement - especially among Millennials - and Ford is taking the trend one step further by offering car buyers a quick and inexpensive way to express themselves with tattoos for the new 2012 Ford Focus. "Millennials have a very personalized, artistic side to their lifestyle, and their vehicle is a very important part of that," said KC Dallia, Focus brand manager. "With its striking front end, sleek profile, dramatic rising beltline and athletic stance, the Focus provides the perfect canvas for customization." "The one-size-fits-all model isn't really relevant to today's consumers, and it's not necessarily a desire to stand out from the crowd. It's more of a desire not to be lost in the masses," she said. "People are personalizing everything - cell phones, computers and clothing - and it's no different with automobiles." Ford Custom Graphics developed for the new Focus will range in price from $120 to $470 and can beasily removed, providing younger customers with an economical way to "grow with their car," says Connelly. "People are holding on to their vehicles longer, and the way we identify ourselves today may not be the way we want to express ourselves tomorrow," she said. "Customers can easily change the tattoos as their life situation and style evolves." 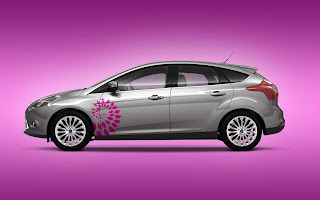 Original Wraps Inc., a provider of on-demand custom graphics to the automotive industry, developed the tattoos and the website for Ford. According to the company's chief executive officer Tom Stemple, the tattoos offer customers the look of custom paint at half the cost. "Another important benefit is that the tattoos are made to order. We don't manufacture any graphics until they are purchased," said Stemple. "That gives us the flexibility to keep updating the designs to give customers fresh new ideas to choose from." 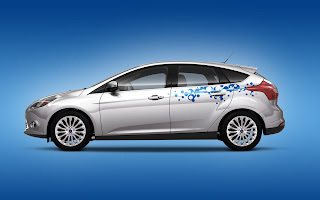 The all-new 2012 Ford Focus, which will arrive in dealerships early next year, will offer customers plenty of choices at production, including four trim series - S, SE, SEL and Titanium - and 11 unique wheel styles. The automotive aftermarket has grown into a $34 billion industry. And Ford Vehicle Personalization continues to come out with cool new products - from wheels and decklids to hood scoops, grille inserts and vehicle tattoos - to meet increasing customer demand for accessories. "The goal of Ford Custom Accessories is to give customers new ways to make the vehicle their own," said Jim Abraham, Ford Licensed Accessories manager, noting that the business of Vehicle Personalization at Ford has grown exponentially over the last few years. "Our accessories are designed alongside our vehicles, so the integration is seamless and reflective of Ford quality."